Time after time, surveys reveal that our number one fear is public speaking. Learn how to prepare & deliver business presentations, talks or speeches with bold assurance. - Publisher Whether preaching or witnessing, speaking is a critical communication tool in almost all facets of Christian life. This book brings the Bold Assurance concept to Christian leaders and laypeople, giving them a tool to help them use their minds, mouths, and beings to communicate effectively. Readers will learn the tools for powerful and effective communication based on two things: biblical truth and proven concepts from the business world. For the first time, Christian laypeople and leaders alike can reap the benefits of speaking boldly and skillfully by understanding how God uses us as communicators. - Publisher Combines a biblical view on public speaking with practical methodology to help you become a powerful speaker, whether preaching, witnessing, or making a boardroom presentation. About "Speaking With Bold Assurance"
Whether preaching or witnessing, speaking is a critical communication tool in almost all facets of Christian life. 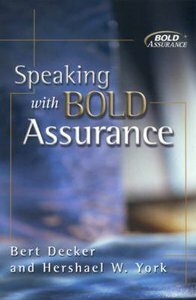 This book brings the Bold Assurance concept to Christian leaders and laypeople, giving them a tool to help them use their minds, mouths, and beings to communicate effectively. Readers will learn the tools for powerful and effective communication based on two things: biblical truth and proven concepts from the business world. For the first time, Christian laypeople and leaders alike can reap the benefits of speaking boldly and skillfully by understanding how God uses us as communicators. Combines a biblical view on public speaking with practical methodology to help you become a powerful speaker, whether preaching, witnessing, or making a boardroom presentation. Hershael W. York (Ph.D., Mid-America Baptist Theological Seminary) is Victor and Louise Lester Professor of Christian Preaching at Southern Seminary, Dr. York led the thriving congregation of Ashland Avenue Baptist Church in Lexington, KY during a time in which the church experienced tremendous growth. Since coming to Southern, Dr. York has authored two books on speaking and preaching Preaching with Bold Assurance and Speaking With Bold Assurance: How to Become a Persuasive Communicator (both with Bert Decker) and,has been featured in Preaching Today as one of the best preachers in North America, has spoken at the International Congress on Preaching, and has served as the President of the Kentucky Baptist Convention. He is currently the pastor of the Buck Run Baptist Church in Frankfort and frequently ministers in Brazil and Romania. He has also served as pastor of the First Baptist Church of Marion, Arkansas, and served as Chancellor of the Lexington Baptist College.